Mega Sale! 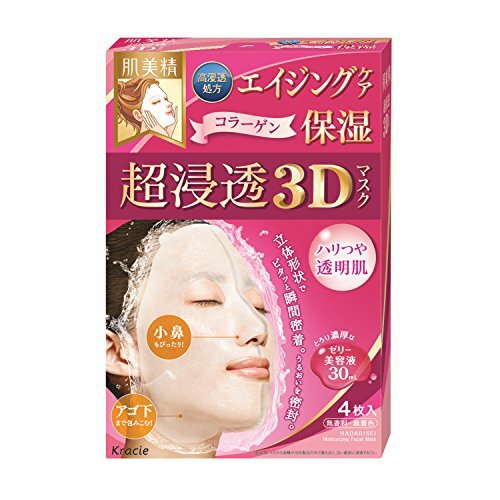 Save 23% on the Hadabisei Kracie Facial Mask 3D Aging Moisturizer by Hadabisei at Elastic Heart. MPN: 暂无. Hurry! Limited time offer. Offer valid only while supplies last. 4 Sheets three dimensional anti-aging, moisturizing facial mask. The mask's innovative shape fits snuggly on facial curves including sides of nose. 4 Sheets three dimensional anti-aging, moisturizing facial mask. The mask's innovative shape fits snuggly on facial curves including sides of nose. Envelopes entire face gently allowing essence to be absorbed into skin effectively and evenly. The milky essence penetrates and treats skin leaving it translucent and soft. Nano-size particles in the beauty liquid absorb deeply into skin without leaving residue - only supple softness. Mask also contains fruit acid (lemon extract) to soften keratin and allow moisture to be absorbed into skin effectively. How to use? After cleansing and toning, spread the mask carefully and position the mask on your mouth area and slowly stretch out to your whole face. Leave the mask for 5-15mins (if you have very dry skin, leave the mask on for 20mins). Remove it and massage the remaining essence until it is totally absorbed, follow up with a moisturizer for complete protection. Use 1-2 times a week. Made in Japan. If you have any questions about this product by Hadabisei, contact us by completing and submitting the form below. If you are looking for a specif part number, please include it with your message.